On the Southern tip of Africa, in the heart of the Cape Winelands, the Helderberg area comprises the towns of Somerset West, Strand and Gordons Bay. 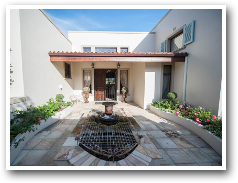 Designed by an award winning architect in the French colonial style, Li Belle Guesthouse is situated in the secure and established residential suburb of Heldervue in Somerset West, a mere 20 minutes drive from Cape Town International Airport, 15 minutes from the new Cape Town Film Studios and 35 minutes drive from the bustling Cape Town City Centre! 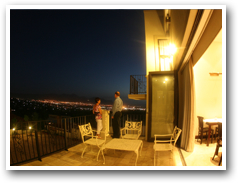 Featuring panoramic views of False Bay and the surrounding Hottentots Holland and Helderberg mountains Li Belle Guesthouse is the ideal base to explore the best that the Cape has to offer. No attention to detail has been spared in the superbly stylish décor. Our three luxurious rooms and junior suite are individually fitted with all modern comforts, meeting international standards.. Guests can comfortably relax in the pool or lounge area at own leisure or spend lazy sun-filled afternoons on the spacious patio enjoying the breathtaking views on offer. A superb Continental or English breakfast is served in the lounge or on the patio. Secure off-street parking facilities are also available. Managed by Alma du Preez, a professional make-up artist, Li Belle Guesthouse specializes in accommodating bridal parties. This site has been viewed 261425 times. Copyright Li Belle . All rights reserved.